Towards the end of the nineteenth century and into the twentieth century - particularly in the first decade - scientists in Australia turned their attention in force upon the high country. Lendenfeld might be considered to be the first of this group. Possibly misled by his guide, but probably due to wishful thinking. Ledenfeld considered the second highest mountain (the present Mt. Townsend) to have been the peak ascended and claimed the highest by Strzelecki. He announced his discovery of the true highest mountain, giving it the name „Townsend”. Mount Kosciusco is a term applied to the whole mountain, and different parts of the plateau also called Mount Kosciusco by the inhabitants of the valleys of the Murray and the Snowy River. This term, moreover, does not exactly apply to the rocky peak which to the Snowy Valley people call Mueller's Peak (as Mr. Spencer informs me). This peak [our Mt Townsend] is the one wish is always ascended who go on an excursion to Mount Kosciusco. Kosciusco Plateau — The plateau extending around the highest peaks, particularly in a north-easterly direction; named by myself after Mount Kosciusco. Geographer E.C. Andrews of the Departments of Mines, Sydney, visited the area in January 1907 with a large party including T.W. Edgeworth David and C.A. Sussmilch. From this, his own investigations to do with the Geological Survey of New South Wales, and all other research carried out regarding the subject up until this time, Andrews prepared in a important paper on the „Geographical Unity of Eastern Australia in Late and Post Tertiary Time, with Applications to Biological Problems”. 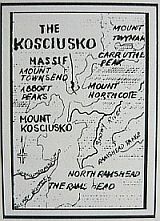 It was read before the Royal Society of New South Wales on 2 November 1910, and it was this paper that the name Kosciusko was introduced into the concept of uplift, faulting, folding, horst and senkunfeld that was just commencing to be put forward to explain the formation of the eastern highlands. To this momentous period in the late history of Eastern Australia the writer would suggest the name of the Kosciuszko period, after the famous mountain and range of that time, which form the grandest and best known horst of the Eastern Australian Highlands. Throughout this paper the late Tertiary up lift will be called the „Kosciuszko Period” . The term „Kosciusko Uplift” has been on lips of scientists from that day to this. Its detail and its timing are being reassessed, but the term lives on. To those who roam the summit area, the roof of Australia seems to be naturally confined to a clearly limited area. It may not be strictly correct to refer to such a limited area as a massif, but for the purposes of his study it is at least expedient to do so. In order to differentiate this bumpy penthouse roof sitting on top of the larger mass which, in a sense, may also be considered „Kosciusko”, here this top elevated mass (generally above 2000 meters, extending from Twynam to the Rams Heads, from somewhat north of Townsend to somewhat south of Kosciuszko), is called the Kosciusko massif. When Thomas Townsen was recording „Kosciusko” or „Straleski's Munyangs” in 1850 it is a clear that be was referring to this mountain mass. „Highest Munyang” or „Middle of Straleskis” served to narrow the sighting. There are many places in Strzelecki's description where he seems to be using the name Kosciuszko to cover this mountain mass rather than the „highest pinnacle”. The „Mount Kosciuszko” (the more correct Polish spelling) of his Physical Description … may more easily be interpreted to have this meaning, as can the „Mount Kosciusko” of his Report - the latter, however, not all occasions. Lendenfeld, Robert von.1885 - Report to the Honorable J.P. Abbott, M.P.Minister of Mines, by Dr. R. von Lendenfeld of the results of this recent examination of the central part of the Australian Alps. Department of Mines, Sydney, 21 January 1885.